You'll have to excuse the network-wide broadcast (well, except Apple Thoughts of course), but I thought this was something that everyone would want to know about: Microsoft is offering the forthcoming Windows 7 at a steep discount, but only for a limited time. 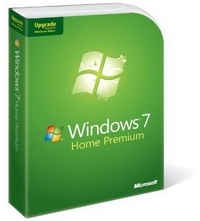 Until July 11th, you can purchase Windows 7 Home Premium Upgrade for $49.99 USD (that's an Amazon affiliate link, so your purchase helps support Thoughts Media). The normal price of Windows 7 Home Premium Upgrade is $119.99 USD, so that's a very significant level of savings ($70 to be precise). You can also pick up Windows 7 Business Upgrade for $99 if you want that version. When Windows 7 is released on October 22nd, Amazon will ship you the software. The Windows 7 upgrade will work on a computer with Windows Vista or Windows XP installed. If you have an older computer, you may want to run the Windows 7 Upgrade Advisor to make sure your computer is ready for Windows 7, but in general any computer built in the past four years should be able to run it just fine. Windows 7 is lighter on resources and works well across a broad spectrum of hardware. Got a netbook? Then you'll want to take advantage of this offer as well - I'm running the Windows 7 Release Candidate on an MSI Wind, and an HP Mini 1000, and it works really well on both of them. I think Windows Vista is a fine operating system, but Windows 7 is even better - it addresses many of the concerns that people had with Windows Vista and adds a degree of polish that means everything is easier to use. Unfortunately, this offer is only valid in the USA and Canada (Canadians can order from Amazon.ca, Future Shop, and Best Buy). as far as I can tell. Europe is getting a different version of Windows 7 due to the lawsuits Microsoft is undergoing there. And you can get in on this even if you're out of cash today. Stores like Amazon.com don't charge until it ships. Worth considering: The Win7 upgrade can be installed on top of an existing Vista config but it requires a virgin install on an XP system. Which is another way that if you have an XP license around, the upgrade is equivalent to the full version. I pre-ordered 3 upgrades for Home Premium this morning. At $165 USD (including shipping and tax), It just a little more than one upgrade at regular price. I was tempted to make one of them a 7 Pro, but I could think of a good justification. Currently I have 2 Vista Home Premium notebooks, one XP Pro notebook and two XP Pro desktops. One is my HTPC (SageTV) and the other is my file server. I'll probably eventually replace the latter with a WHS box. I am very pleased (irony) to see that MS keep screwing Vista Ultimate owners. I agree completely that people who paid extra for Vista Ultimate didn't end up getting enough to make it worthwhile - the "Ultimate Extras" were all kind of lame, and not worth the upcharge that Microsoft did on Ultimate. But how is this program "screwing" Ultimate owners? Because there isn't a special price for Ultimate owners? I don't know how you can get much better than 50% off MSRP - well, unless it was free. I would be curious to know what features prompted the Pro decision. The 3 differences checked in the comparison box were nebulous at best. Yeah, that list is pretty lame - I'd guess it's Remote Desktop, that's the feature that a lot of people really like. But there are many great, and free, options to get that.